“We are living in an era of entitlement, a term used to describe a strange malaise gripping many of our youth. Children from a surprising variety of socioeconomic groups, who have been given too much with little or no effort on their part, clearly feel they deserve to have what they want, when they want it. The symptoms of these “gimmies” are easy to recognize – the insatiable craving for more stuff while showing less appreciation, less interest, and less valuing for what they already have.” Forward by Linda Jessup for Earn It, Learn it by Alisa Weinstein. Alisa, in my estimation, you have written a brilliant, iconoclastic book in a field already crowded with parenting books representing a huge variety of techniques intended to help parents raise healthy, happy and productive children. LOL! That sounds so unbelievably amazing and surreal coming from someone who isn’t my parents. J Sincerely, deeply—thank you so very, very much! In your case, you are exploring fairly unchartered territory: teaching children the value of money, work and time well spent. Parents will identify strongly with your first paragraph describing your visit to Target, where your four-year-old needed to have the glittery lip balm on the shelf (despite having 13 more at home), and you finally realized that something needed to change in your family. Tell me more about this pivotal moment and the subsequent creation of your method called Earn My Keep. A: I think what was most pivotal about that moment is that, initially, I didn’t realize how pivotal it was. All I knew was that my four-year-old had the “gimmies,” and in my exasperation, I told Mia to “Get a job and pay for the lip balm yourself!” At which point the concept just hit me: I was going to pay her for having a “real” career. Her first was market researcher—her choice, since that’s what Daddy does for a living. The two of them had so much fun together, surveying friends and family about their favorite ice cream. But it was immediately clear that so much more was also going on. Besides the fiscal introduction, Mia was practicing professional-level manners, she was creative problem-solving, she was learning words like “pie chart” and “follow-up question.” It was probably only three or four weeks later that I realized an entire program could be developed around the concept. Which led me to interviewing 49 professionals, and translating their everyday responsibilities into more than 950 kid-friendly tasks. Q: Your contention, that giving children an allowance hasn’t changed in the more than 100 years of existence gives pause for thought, and that earning money, especially for (or not for) basic household chores, offers little more than “change in the bank” and customary (annoying) groans of “Do I have to?” Can you say more about this? A: When I unearthed the fact that today’s American parents are handling financial education the same way our great-grandparents did, I got chills. Has there really been no change in all this time? Parents either dole out money OR they pay for household chore completion. But giving children money for no effort misses out on an opportunity to teach more. And paying for chores sends the message that work isn’t fun. Plus, it’s not realistic—no one gets paid for making her own bed. But earning money for doing something that appeals to your own interests is exciting and motivating. It encourages kids to seek out a more personally fulfilling professional life. And it helps them learn that the work we do can be worth more than the numbers on a paycheck. Q: What does Earn My Keep offer parents that other philosophies might not? A: The biggest difference is that Earn My Keep starts at the beginning of the financial process. Other philosophies start with what I call the Part II: what to do with money once it’s earned. 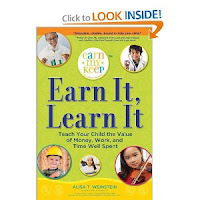 But Earn My Keep starts with Part I: how adults earn money in the first place. This offers a much more well-rounded, full-circle picture of the process—one that helps kids connect with the efforts involved in working as much as they connect with the money they’ve earned. It also helps them appreciate how hard Mom and Dad work to support them financially! And there’s other great things about the method, too (I say a lot of this in the book’s intro): Earn My Keep helps parents differentiate between things we do as productive family members (like making the bed and clearing the dishes) and things we do to pay our bills; it exposes kids to art, culture, creative thinking, manners, math and so much more—without kids even realizing it; it introduces a whole bunch of career opportunities and the idea that passion and job satisfaction exist—a major component to achieving a better quality of life in adulthood; it teaches children that we depend on each other to make the world work, and how accepting that responsibility can make the world a better place; and it gives parents that incredible feeling that comes from satisfying a child’s curiosity about the adult world. Q: You indicate that after employing this method, children are often more amenable to doing the more mundane tasks we undertake “(just) because we are members of the same family.” How does that happen? Q: Parents, esp. new older mothers, are beyond-stressed these days with two-parent working families, aging parents and shrinking budgets, just to name a few problems. How can they incorporate this philosophy easily into family life without feeling like this is one more task which needs to be accomplished? A: I love, love, love this question because I sincerely feel that if I can do it, anyone can do it. The trick is to blend Earn My Keep into your life, not work your life around Earn My Keep. Another bonus: I use Earn My Keep as a way to check off a number of my parenting priorities in one fell swoop. To get this all done, I recommend doing lots of Level 1 tasks (these are the ones that take 15-20 minutes, use little/no supplies of any kind and can be done at the dinner table, bedtime, in the car, etc.). And I encourage parents (stressed or not) to rely on regular life goings-on for inspiration. Throwing a party? Have little Event Planners make and send out the invitations. Little Accountants could stay on top of the budget. Little Musicians could write and perform a song or two. Even little Dietitians could be responsible for giving a family-favorite recipe a healthy spin. Q: What age would you suggest starting this method? A: Four, four, four and four. J It doesn’t have to be right at four. But that’s about the age you’ll notice kids recognize money exists, and that it’s what Mom and Dad use to satisfy needs and wants. Earn My Keep is comprehensive and flexible enough it can be utilized up to age 12, but the earlier we start, the more natural the kid’s relationship with money can be. Q: In a nutshell, please describe the process and the intended outcome? A: Super-simple. There’s 49 careers in the book (the 50th is a Create-Your-Own). Families pick a career, and then a task from that career’s profile. The kid completes the task to the best of his ability on/before a pre-determined deadline. Then on Payday, he gets paid. That’s it! And what you’re looking for isn’t a professional-level product. What you want is to see is good old-fashioned effort. Follow-through. Completion of a process. Your Chef’s cookies could taste like tire rubber, but if he read the instructions all by himself, worked out the math, stirred, poured and watched the oven (all of which maybe for the very first time), your kid has absolutely earned his keep. Q: Can you further describe the 50 professions you present in the book? A: The professions and the professionals behind them go hand-in-hand. I worked with the most wonderful, talented, generous, kind, passionate group of folks you could possibly imagine—all of whom donated countless hours to this project. There’s an eclectic mix of science (Astronomer), math (Banker), art (Curator), culture (Diplomat), social responsibility (Environmental Planner), technology (Transportation Engineer)—you name it—all selected with extreme purpose. I wanted there to be something attractive for every child, no matter her learning style or interests. And to have enough breadth within each career that any kid may discover something he never realized he enjoyed doing. And besides the more than 950 tasks, there’s fun facts, bios, interviews—truly, this is a wealth of information for everyone! A: Hee—open the book! 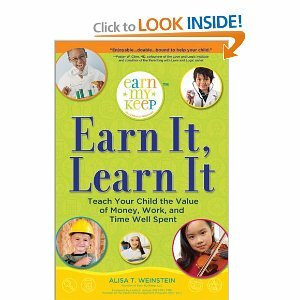 J The Earn My Keep Experts poured their hearts and souls into every page. But if a parent wants to create a totally new career I include tips on where to find them. And sometimes the best place to look is in the mirror! Kids are so intrigued by what Mom and Dad do every day at work, starting with your own career is a terrific way to jump into the program. Q: How do you decide payment (amounts) and intervals? Q: I have what I call “slouchy” kids – they slouch off every chance they can despite my unwillingness to let them do so. In fact, I’d say that they both lack true passion about most things in their lives. What do you suggest for children who are not necessarily self-motivated or goal-oriented? A: Self-motivation is a practiced skill—meaning, it’s not like we’re born knowing how to self-motivate. Or even wanting to self-motivate. Just like anything, the more we do it, the better we get. And I think the key to jump-starting this skill in children is, first, talking about it. Put a definition on “starting and finishing a project for the sake of getting it done.” Pick a low-key time to talk about a moment that you were self-motivated and/or a time you saw your child do the same. Then, broaden horizons. One of the aspects of Earn My Keep many folks find most exciting is the sheer breadth of potential career choices. Kids love pretending to be adults. Understanding that something they enjoy doing (being outdoors, participating in a sport, playing an instrument, baking with Grandma) could one day become a profession for which they get paid is such an eye-opener. It’s truly incredible how that role-playing (or, “real playing”) can spark self-motivation. Q: You’ve undertaken this method with your daughter for several years, now. What is the most positive aspect of this program and what is the most negative? Alisa T. Weinstein pours sixteen years of award-winning copywriting know-how into Earn My Keep, LLC, a multimedia initiative that includes the book and EarnMyKeep.com. With a degree in Journalism/Advertising from the University of Maryland, she uses her creative background to squeeze educational and engaging experiences into her active (read: typically crazy busy) life with her husband and two children. She can be found @ www.earnmykeep.com.